When I was watching Rihanna's "You Da One" video, I was struck by two things: one was the incredible shot-by-shot similarity between Rihanna's work and an old Numéro editorial by Solve Sundsbo (which director Melina Matsoukas, who previously was caught ripping off an old David LaChapelle editorial for another Rihanna video, failed to credit). The other was her nails. Those nails, I thought, are pretty awesome. So I decided to try replicating them at home. Did Rihanna Steal The Concept For Her New Video? These nails! Aren't they cool? They look a little bit like a '30s-style "moon" manicure, but more aggressive. I dig. Click any image to enlarge. Here's what you'll need, clockwise from top left: 1) Nail polish remover. 2) A nail file and nail clippers. 3) Top coat (I use Sally Hansen's Insta-Dri, because it's the best). 4) Base coat (I use OPI's Nail Envy, and it's all right). 5) Two colors of nail polish (I used a bright blue from Forever 21, of all places, for the triangles, and a cherry red by Skinn for the nails). It helps to have a narrow brush, like my blue color. But if you don't have a color with a narrow brush, you could use a nail-art pen for one of your colors, or a toothpick and a regular bottle of polish. Side note: I've been using this Skinn Hard Coat polish a lot lately, because I've found it to be really durable. Like ten days, easy. First, prep for your manicure. For tips on that, see here. When your nails are clean, shape them with the clippers and file — you can copy Rihanna's super exaggerated talon shape if you want, but long nails attract more chips (unless you, like RiRi, have acrylics). When you're done, wipe each nail with polish remover on a cotton ball or a tissue. Now, there are several ways to do this design. 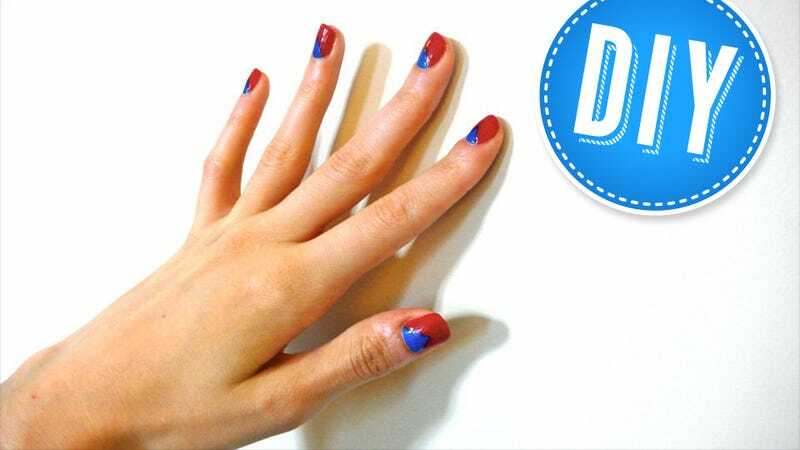 I did it a few weeks ago (you can see a few pictures in my last purse DIY) by first applying the triangle color all over my nails, and then applying the nail color on top with a toothpick. That was fiddly, and I had a hard time getting the colors to show up correctly because my triangle color (black) was darker than my nail color (the same cherry red). I ended up needing to do a lot of layers, but I can see that method working well with a lighter triangle color and a darker nail color. This time, given I had two colors that were relatively evenly matched in intensity, I decided to very carefully paint on the triangle color in an actual triangle, and then paint the nail color equally carefully around it. First, make an "X" on each nail. Then use the tip of your nail file — or a toothpick wrapped in a little bit of cotton, and dipped in remover — to gently clean up the top of the "X" so a "V" is all that remains. Paint the bottoms of the triangles, then fill them in. Do a second layer if necessary. Don't worry if the polish is a little chunky, the top coat will penetrate all the layers, even them out, and harden the whole manicure. Now, using your nail color, carefully paint a second, larger "X" alongside your little triangles. Use the surface tension of the nail polish to sort of glide along; the two polish colors should touch at the edges, but not overlap. When the first "X" is done, take the brush and spread the nail polish out to cover the rest of the nail. Wrap the polish around the nail tip, for durability. Add a second layer. Don't worry if there's polish on your cuticles or under your nails, you can peel it off later (just wash your hands in hot water after your manicure is dry). Next comes the top coat. And then once it's dry, voilà! Dab on a little cuticle oil (I use olive oil or castor oil), peel off any polish that got on your skin, and go.